rampicante | What is That and How Do I Eat It? Which leaves little time for farmer’s marketing and even less time for cooking and blogging. But how do you NOT buy this when you see it at the market? Especially if you like zucchini, which I do. I’m a little annoyed at the Summer Squash selection this year, frankly – everyone’s got a blog post about what to do with all that zucchini that is so clearly taking over your garden that you need to make it into breads, fritters, cakes, casseroles, and other creative, delicious-sounding recipes, and here I am, zucchini-less. My garden won’t grow (probably because I forget to water it), and none of the sellers at the market seem so flush with zucchini that they’re marking down the prices into the ridiculously-cheap category, which means if I buy zucchini, I’m buying it to use for its sweet, squashy self, not to use it up. 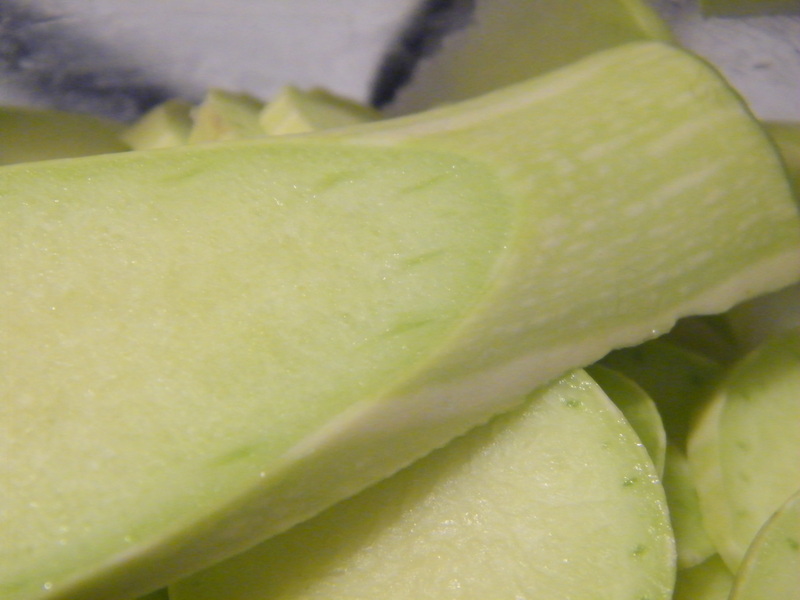 Which I guess is a gigantic tangent to: How I Found a New Yummy Zucchini. Usually called Tromboncino Zucchini or Zucchetta Rampicante, it’s also sometimes just called Squash with some horribly misspelled version of one of those names in parentheses on the farmer’s handwritten sign. Summer squashes have far more variety in flavor than one might expect, given that they’re always lumped into that same massive category. There’s crookneck and zucchini and patty pan and little stripey ones that the husband and I like to refer to as hand grenades… Rampicante is slightly sweet and slightly nutty. 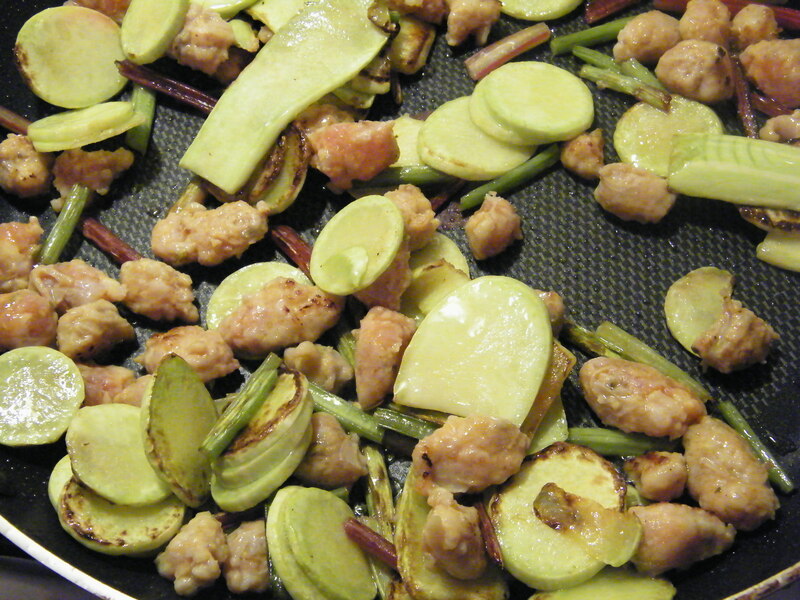 It’s most similar to zucchini in flavor, but a little nuttier. I don’t think it’s as mealy as crookneck, but sources differ on how to avoid the mealies with this guy: some say that the young ones start out quite mealy, others say that the younger/smaller fruits will always be the sweeter and more flavorful, so if you’re worried about mealiness, go with one of those. How to tell? They turn into a trombone as they grow, so shorter, straighter squash are what you would look for, though it’s possible to grow them straighter by trellising them, so again, look for short if you’re looking for young. This sucker is pretty full-grown, maybe 2 or 3 feet long if you stretched him out. Personally, I think the problem is steaming at any size. People are constantly telling me to steam squash because it’s so healthful that way, but to me, it tastes like mealy baby food. Not a fan of any kind of steamed squash, frankly. 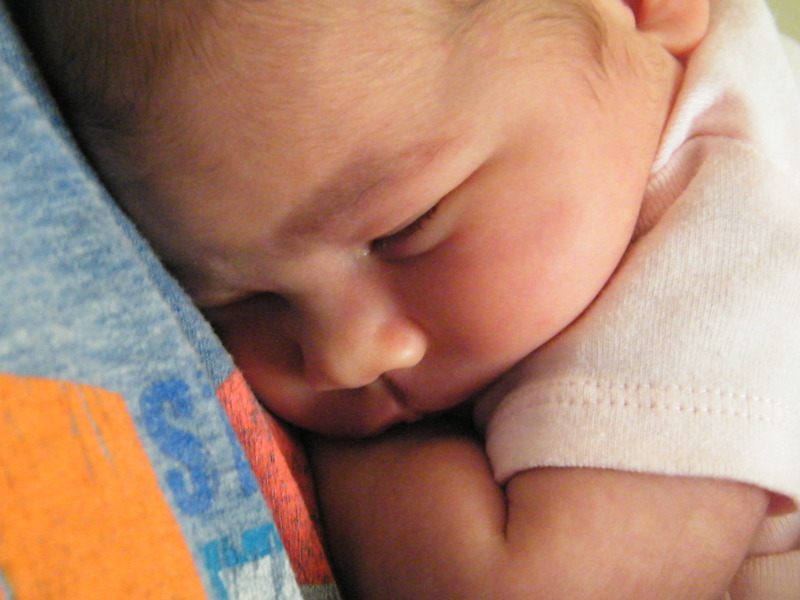 They have a very pale green skin, sometimes almost pale yellow or tan, sometimes so light they look almost white. 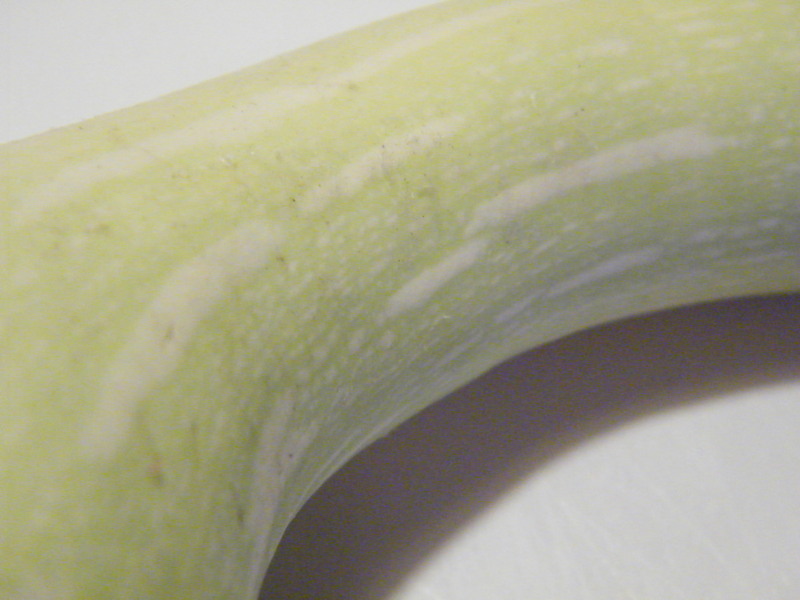 They tend to have varied faint white stripes like some zucchini varieties as well. The really nice thing about this variety is that all the seeds form in the bulbous part at the end, the way seeds all collect in the center of hard squash. That means you’ve got this whole long length of stem with no seeds. 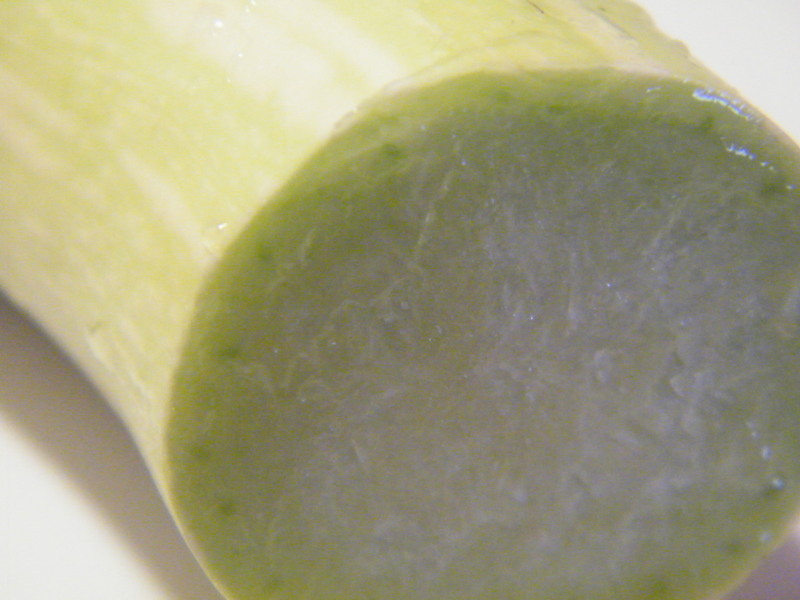 It’s drier and firmer than zucchini, though the pores near the skin do weep when you cut it, but I imagine if you wanted to make something akin to Rampicante Parmesan or Fried Zucchini (dredging in flour and deep frying) it would probably be excellent for that since it is drier than its cousin who can sometimes get mushy. The skin is edible as well – a bit tougher than zucchini skin, but nowhere near winter squash toughness or even delicata squash or something in which people tell you the skin is edible but the texture’s tough and awful… All this means that Rampicante are really, really easy to work with, so you get a lot of bang for your buck. Which is nice, because I’ve only seen one or two sellers with them ever, which means they’re twice the price of other summer squash per pound. C’est la vie for the experimental veggie eater. 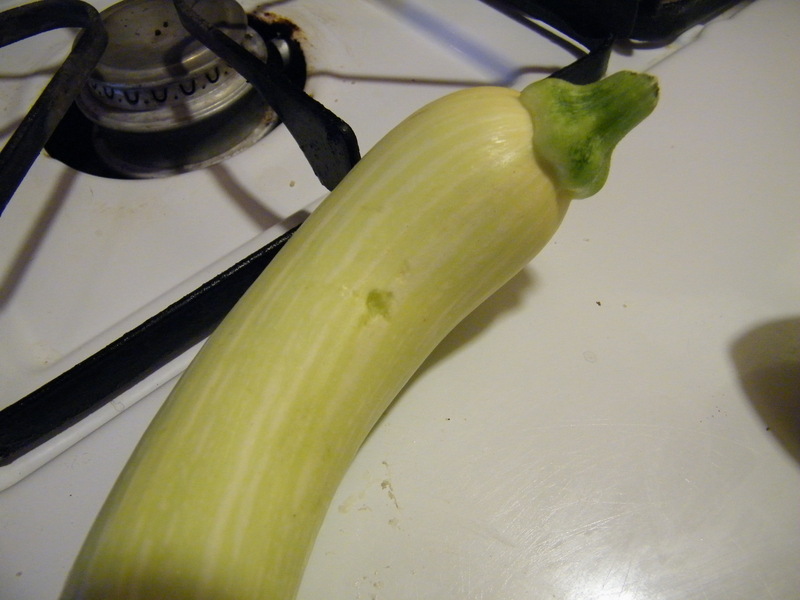 Actually, that’s the weird part about Tromboncino – pluck it early, and you have got a summer squash that’s basically edible from end to end minus the seeds. Let it grow big and keep it around, and the skin will grow tough like winter squash, so it stores well. If you’re worried about your personal fruit having too tough a skin, go ahead and peel it. I’ve only bought it as a summer squash; the online consensus seems to be that as it matures into a winter squash, the texture gets stringier, more watery, and less flavorful, much like the interior of a carving pumpkin, so I think I’ll stick with the summer harvest for now. Like I said with the zucchini this year, I’m not wasting this puppy on “use it up” recipes, but you don’t need to. 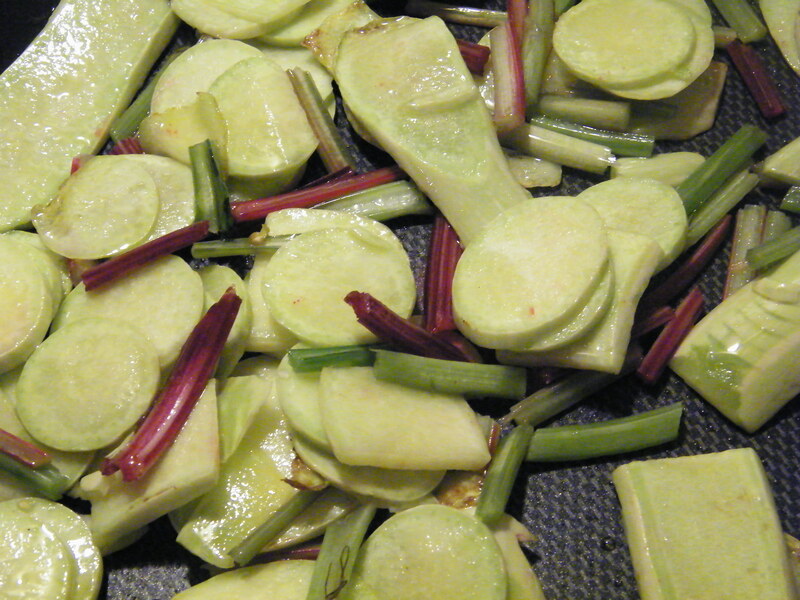 Zucchini is often easy to julienne or similar because of its straight shape; rampicante is easier to slice into rounds. If you have a food processor, chop the neck into straighter sections before putting through the slicing blade and you’ll have a gagillion Rampicante rounds in no time. If you put the bent part in, you’ll have long slices instead. I like to saute in olive oil and garlic and toss into practically any dish – it does take a bit to cook through to the center if you slice too thick, so try to keep them just a cm or 2 in width if you’re slicing by hand. Half-inch rounds are just too big. They’re also nice tossed with olive oil and salt and roasted on 400 or 450 like beet chips until crisp, or crisp-ish really. They’re a great alternative to potato chips or some other horrible for you snack. Notes: There are no measurements because it really is to taste and depends on the number of people being served. Half a trombone zucchini served 2 hungry adults and a toddler; likewise half a bunch of beet greens, but we’re veggie-happy and everything depends on how big a bunch you get. For the sausage, my lazy strategy is to simply hold the sausage over the pan and use kitchen shears to lop of pieces – no cutting board to disinfect afterwards! Same thing with the goat cheese: I buy it in a log and just use a fork to hack off chunks right onto the plate. Slice your rampicante however you like and remove the lower stalks from your beet greens, chopping them into 1/2 to 1-inch size pieces. Saute in olive oil until everything starts to soften, then add sausage. Cook until sausage is brown and slightly crispy – don’t stir too often or the sausage and rampicante won’t crisp up. This is very much a “leave it alone, I have dishes to do and a toddler to wrangle while dinner cooks” kind of meal. While these are cooking, boil water and start the pasta cooking – this goes nicely with any carb accompaniment, frankly, so cous cous, brown rice, barley, polenta, or anything else you fancy makes a fine substitute for noodles. 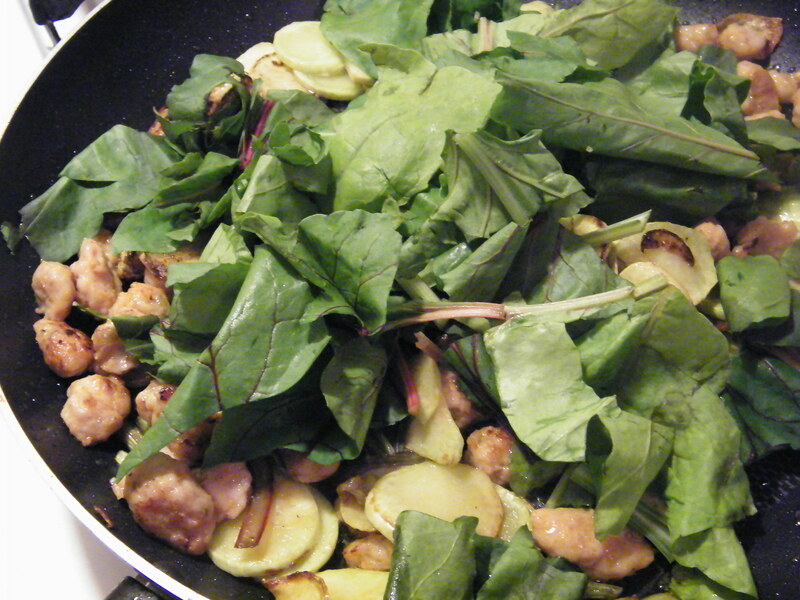 When the sausage is almost done, throw in the green parts of the beet greens – they cook fast, so now is the time to start stirring, adding a bit more olive oil if everything’s looking too dry. 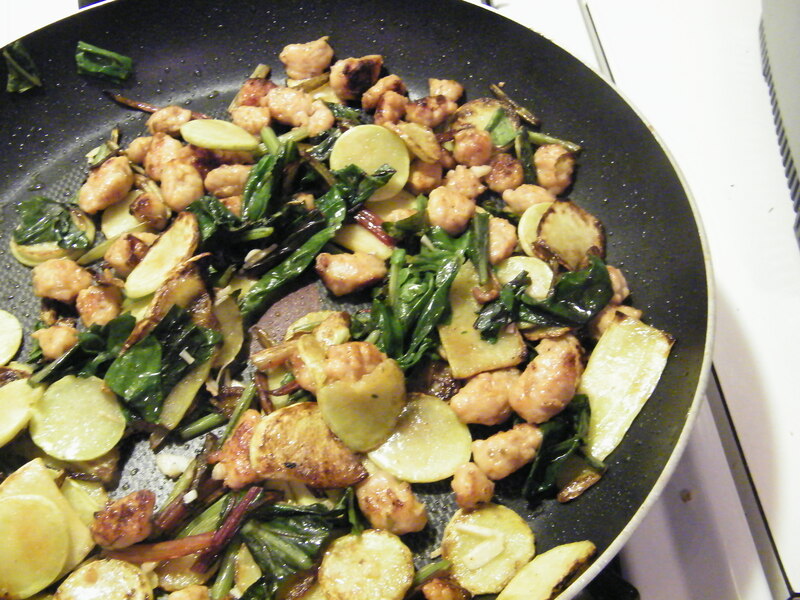 When the greens wilt, toss the pasta in the pan and stir everything together (added benefit: if you mis-timed your carb cooking or are using up leftovers, here is where everything gets to be the same temperature, so feel free to use last night’s leftover Chinese food takeout rice straight from the fridge.) If you’re watching your calories or using up leftovers, add a splash of water instead of the extra oil above – the hot pasta water is great for adding a little thickener. 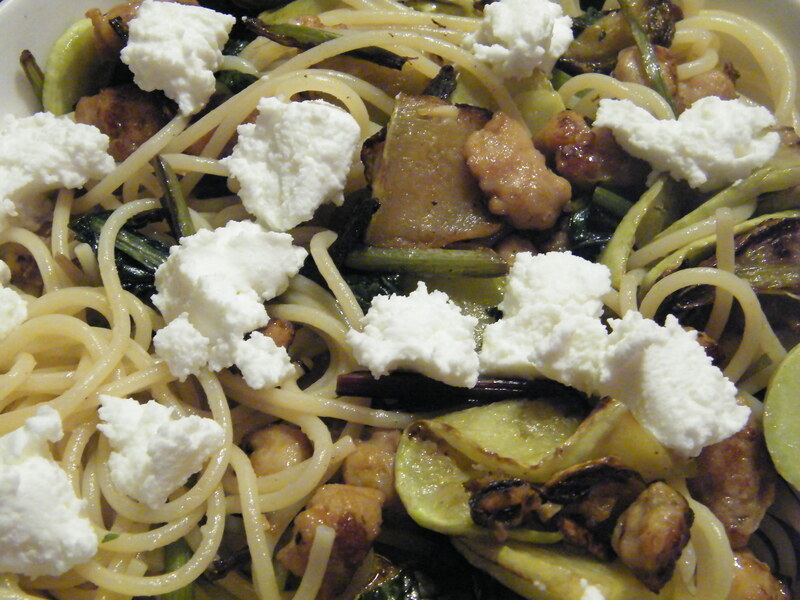 Pour into serving bowl and add chunks/crumbled goat cheese on top – feel free to toss to distribute, but it will lessen the final appearance as the melted goat cheese deliciously though unattractively slimes every strand of pasta. Peel? If it’s young or small or you buy it mid-summer, no. If you’re buying in fall and it’s a big, old fruit, or if you just think it’s going to be too tough for your tastes, yes. 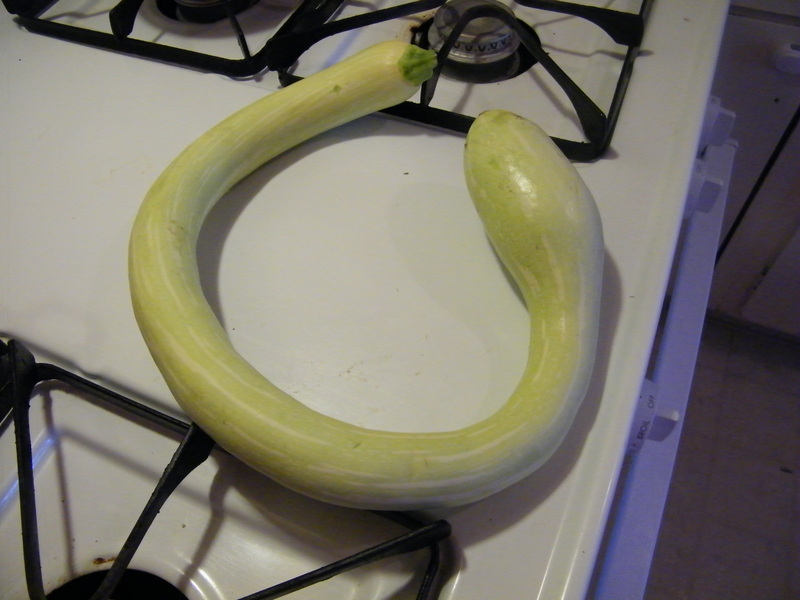 This squash serves both seasons of squash descriptors. Edible seed? No. Scoop them out and toss them. Edible when raw? Yes, if it’s young, though I would probably only eat the neck of the squash raw since the bulb gets more winter squash-like, and I would shred, grate, or julienne – I’m not a huge fan of raw summer squash in the first place, and this variety is a bit tougher than some of his friends, so I don’t know that giant raw hunks of it would be the way to go. Worth the price of organic? Questionable, but probably not. Summer squash in general isn’t a horrible pesticide keeper, and winter squash is one of the least offensive conventional vegetables you can buy. Rampicante is known among squash gardeners as being surprisingly resistant to many bugs that plague other squashes, so it means it probably isn’t getting sprayed down even as heavily as other squashes. Since it’s so rare at the markets at this point anyway, I probably wouldn’t sweat it and would just buy whatever they have, especially if you plan on peeling. If you’re going to eat it skin and all, you may want to take the monetary plunge, but I don’t bother with this guy, and I’m pretty picky about organic when I have the chance. In season: Mid-late summer through Fall – Earlier in the season, treat like a summer squash; later in the season, peel and treat like a winter squash. How to Store: In the fridge when fresh, it should last a good week or longer. 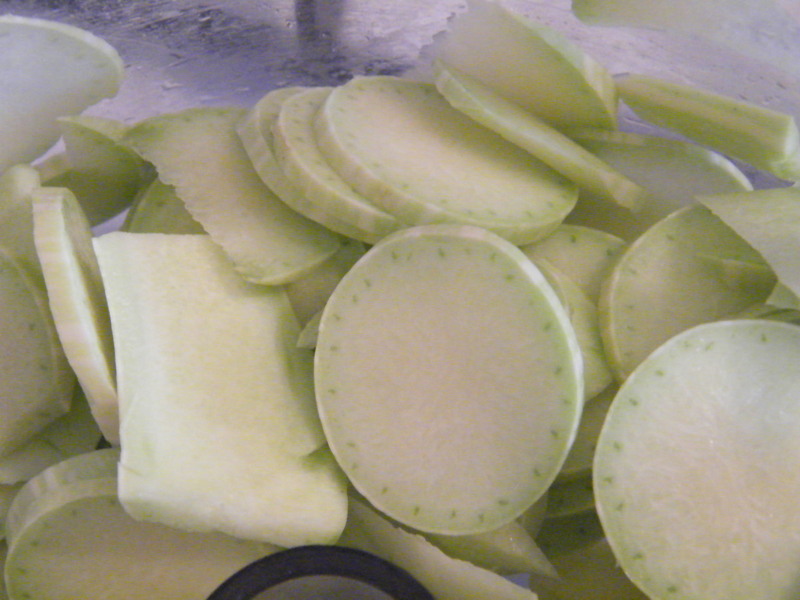 Once cut, the pores begin to weep and it begins to dry out, so use it up within a couple of days at most. You can wrap it in plastic or foil if you like; just don’t shove it into the fridge with the cut part exposed because it will leak sappy moisture onto your shelves or other food…Not that I’ve done that. As winter squash, it can keep uncut in a cool place for as long as a couple of months, but it should be hard-skinned first. If it’s still too young, it will just rot.